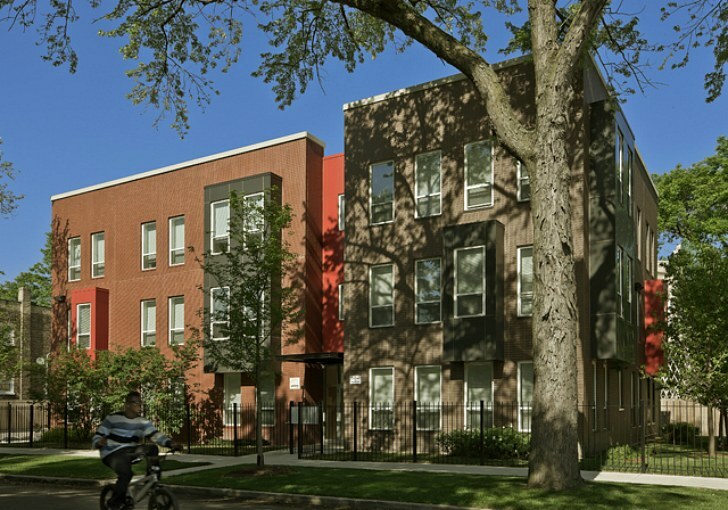 A unique low-income housing development in Chicago's Humboldt Park neighborhood provides 94 affordable apartments for rent, but they aren't all in one massive building. Spread out across 8 buildings in the neighborhood, the Rosa Park Apartments blend into the existing neighborhood fabric and benefit the tenants with good, green building strategies. 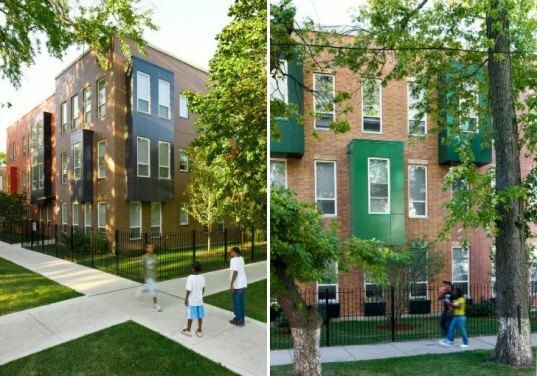 Designed by Chicago-based Landon Bone Baker, and developed for Bickerdike Redevelopment Corporation, these apartment buildings are proving that good affordable housing can be done through economies of scale. Each building makes use of the same modular designed facade, materials, energy efficient strategies and the largest of them has even earned LEED certification. As a way of bringing the price per unit down, Bickerdike made use of economies of scale by building 8 apartment buildings rather than just one. The buildings range from 6 to 27 units each and area all a variation on the theme of the same modular facade. Each building is composed of 8″ thick precast concrete walls with a brick pattern, engineered wood trusses, and colorful modern window bays. Only 2 types of windows are used throughout the project. 6 of the 8 buildings are only three stories tall, while the last two are 4 stories with elevators. Each building went through the City of Chicago Green Permit process, ensuring that many green strategies are apart of the entire development. These strategies include an energy efficient envelope, low VOC finishes and paints, bamboo and PVC free flooring, energy efficient lighting, Energy Star appliances, low flow fixtures, insulated hot and cold water pipes, permeable paving, recycling programs and much more. Building 7, the largest building, was designed for LEED certification and includes a number of other strategies beyond what the others were doing. This building makes use of solar thermal hot water heating for domestic hot water, native and drought tolerant landscaping, an energy recovery system, a geothermal HVAC system, and a green roof. Obviously it would have been great if all 8 of the buildings could have gone through LEED certification, but then again, they probably would have cost too much to turn into affordable housing. A good start, they built it small and made sure they didn't build it bunched up as one massive project. Chicago has good experience with projects such as the infamous Cabrini-Green built from the 40's thru 60's. Over the years, gang violence and neglect created terrible conditions for the residents, and the name "Cabrini–Green" became synonymous with the problems associated with public housing and became a slang term regarding similar buildings. As a way of bringing the price per unit down, Bickerdike made use of economies of scale by building 8 apartment buildings rather than just one. The buildings range from 6 to 27 units each and area all a variation on the theme of the same modular facade. Each building is composed of 8" thick precast concrete walls with a brick pattern, engineered wood trusses, and colorful modern window bays. Only 2 types of windows are used throughout the project. 6 of the 8 buildings are only three stories tall, while the last two are 4 stories with elevators. Each building went through the City of Chicago Green Permit process, ensuring that many green strategies are apart of the entire development. These strategies include an energy efficient envelope, low VOC finishes and paints, bamboo and PVC free flooring, energy efficient lighting, Energy Star appliances, low flow fixtures, insulated hot and cold water pipes, permeable paving, recycling programs and much more. Building 7, the largest building, was designed for LEED certification and includes a number of other strategies beyond what the others were doing. This building makes use of solar thermal hot water heating for domestic hot water, native and drought tolerant landscaping, an energy recovery system, a geothermal HVAC system and a green roof. Obviously it would have been great if all 8 of the buildings could have gone through LEED certification, but then again, they probably would have cost too much to make into affordable housing. Location of the apartment buildings in the Humboldt Park neighborhood.